A misplaced pearl earring. A locket with a lost chain. A glove missing its mate. We’ve all had run-ins with orphaned or defunct accessories, and oftentimes the heartbreak can be overwhelming. But the loss of an accessory doesn’t have to be the end of the world. With a little ingenuity and elbow grease, you can easily upcycle what you might consider trash into a brand new treasure. Here are six solutions for common wardrobe malfunctions that can be spiffed up in a jiffy. Of all the paired accessories, earrings are probably the most easy to misplace. While one solution is to simply wear the lone earring without its mate (mismatched jewelry is one of my favorite things right now), another fun option is to use it to add sparkle to an old pair of shoes. Dangly earrings with hook-style ends work best for this. 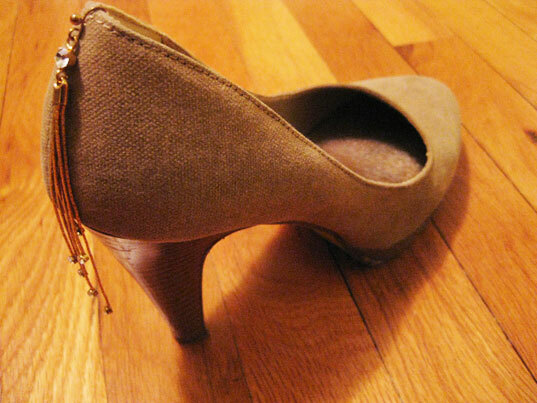 Simply grapple the earring over the back of your shoe and secure the inside with a piece of duct tape. Have a single stud-style earring that you don’t know what to do with? Pin it onto your jacket lapels for instant shine. If you have a locket or other charm lying untouched in your jewelry box because it has lost its chain, here’s an easy way to get it some play in your wardrobe. 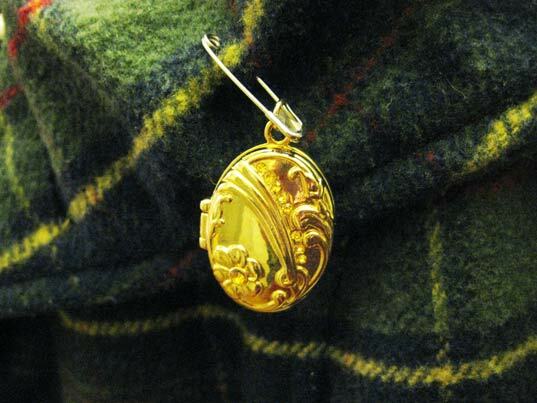 Just get a safety pin that is big enough to support the locket and fasten it onto a coat, shirt, or even a bag. The imperfect look is tres chic and has an effortless, found-object feel that is great for dressing up an outfit in a nonchalant “Oh, this old thing?” way. The loss of a glove is especially difficult to recover from (at least now that the Halloween rush for Michael Jackson costume components is over). Take a tip from Outsapop and copy Dolce & Gabbana’s glove-as-headband runway look. All you need is a glove, a headband, and a glue gun. It’s really that simple. If you’re like me, chances are you’ve collected quite a few necklaces with broken clasps that you’ve been meaning to fix. In the case of my favorite pearl necklace, after much procrastination, I decided that the repairs need not be as labor-intensive as I thought. 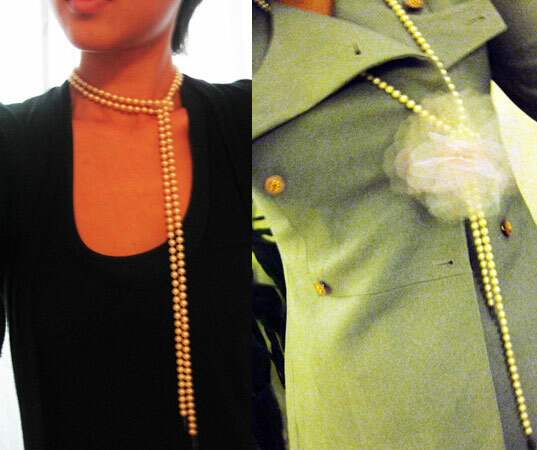 The next time an outfit called for some pearly action, I simply folded the strands in two and looped the ends through, creating an elegant choker. Conversely, you can knot the ends for a classic look, and add a homemade tulle rosette for an extra-special touch. Have you ever purchased a bag that comes with an extra strap that you never use? If so, you’ve either shoved it to the back of your closet or you’re thinking of throwing it away. 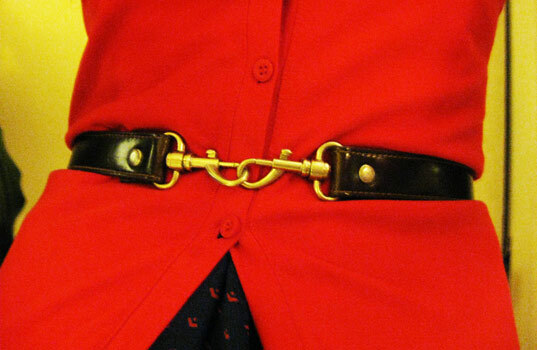 Before you do consign it to oblivion, why not refashion it as a sweet buckled belt? The fasteners give it a classy, old-school vibe that would probably cost you a lot more for a similar belt at the store, and it’s incredibly easy to do. Simply loop the strap around your waist and clip the two ends together. If you need to adjust the length of the belt, just use paper clips or safety pins. How vexing is it when your favorite barrette’s metal clasp snaps off, leaving you with a loose head of hair and a mouthful of curses? If you can find the metal piece, it’s a good idea to try and repair the clip, but if you can’t, upcycle your seemingly useless accessory into a supercool three-finger ring! You’ve probably seen pics of these unique rings in magazines or on celebrities, but they’re pretty hard to find in stores. In other words, a broken barrette gives you the perfect excuse to make your own for zero dollars. The best part? 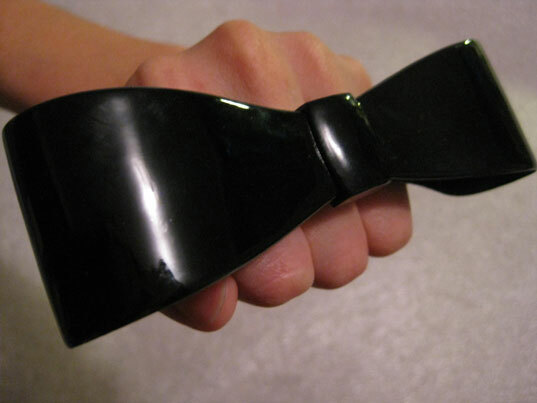 This project requires no glueing or sewing: Just slide the former clip onto your fingers and voila! 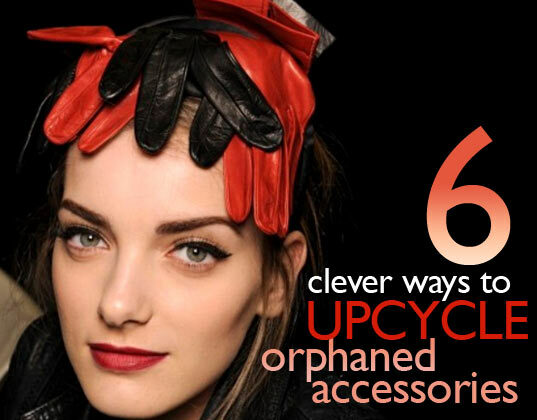 6 clever ways to upcycle your orphaned accessories! A misplaced pearl earring. A locket with a lost chain. A glove missing its mate. We've all had run-ins with orphaned or defunct accessories, and oftentimes the heartbreak can be overwhelming. But the loss of an accessory doesn't have to be the end of the world. With a little ingenuity and elbow grease, you can easily upcycle what you might consider trash into a brand new treasure. Here are six solutions for common wardrobe malfunctions that can be spiffed up in a jiffy. Broken barette got you down?